In 2014, the University of Minnesota's Robina Institute of Criminal Law and Criminal Justice began a multi-state study that was tasked with exploring nationwide variations in the practices and policies of probation violations and revocations. 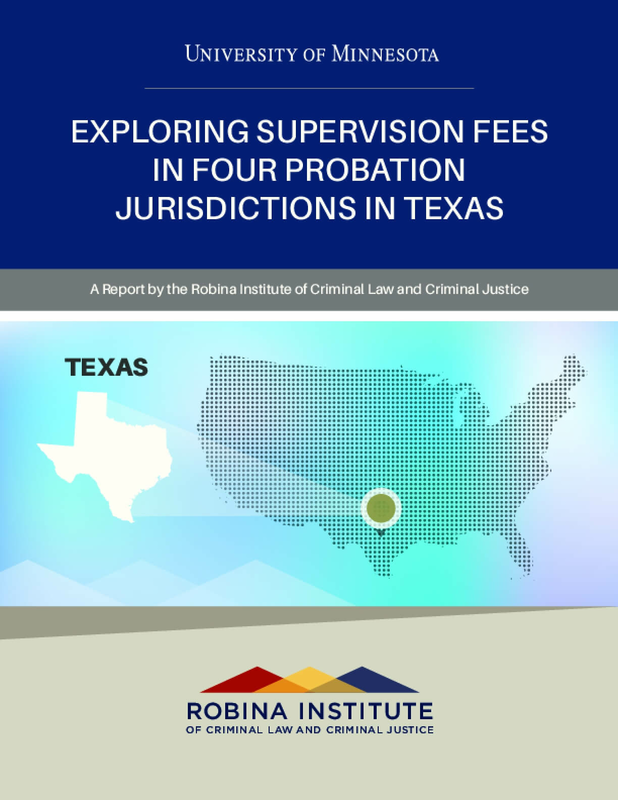 A distinctive finding that grew out of the Robina Institute's work in two Texas counties was that probation supervision fees play a major role throughout the state. Probationers are required as one of 25 standard conditions to pay supervision fees, and—depending on the case— they may have to pay additional program fees, fines, and restitution. Texas probation departments depend on supervision fees for a large share of their operating budgets, and they are responsible for collecting those fees. Because payment of fees is a formal condition of probation, probationers may be sanctioned if they fall delinquent. Additionally, their probation terms may be extended to allow more time to pay, or early termination may be denied. In interviews, some probationers believed they could be revoked to jail or prison for failure to pay supervision fees. However, we heard from probation officers that probationers were not revoked solely for fees. The officers told us that nonpayment may be one reason probationers are revoked, but only when combined with other violations. The Robina Institute was encouraged by other probation chiefs in Texas to add additional counties to our study. To understand the interaction between probation and criminal justice fees in greater depth, the Robina Institute conducted a mixed methods study with 4 probation jurisdictions in Texas. Quantitative data was analyzed to examine the average amount of fees ordered, the breakdown of the fees ordered, and the percent of probationers who were current and delinquent on their fees. The quantitative analysis also examined the outcomes for those who were delinquent on their fees. Qualitative interviews were conducted with probationers to understand how fees impacted them and their experience of probation, as well as how they handled paying their fees. Probation officers were also interviewed to examine how fees were utilized and how officers collected fees. This report highlights some of the findings from qualitative interviews with over 50 probation officers and 46 probationers in 4 probation jurisdictions. A separate report highlights our quantitative findings; future Robina Institute publications will explore the quantitative and qualitative data in greater depth, as well as legal issues associated with the imposition and collection of supervision fees. The first section of this report presents findings from the focus groups with the probation officers. The second section focuses on findings from the probationer focus groups.